There is no status quo in politics. Things really do fall apart, to quote the overly quoted Yeats. For those of us born after WWII, the seven decades of Pax Europa and subsequent founding of the European Union seemed like a permanent state and a symbol of progress and hope for human solidarity. History, it turns out, really is a cyclical story, where collective human action occasionally succeeds but is often defeated by the other deeper and stronger human impulses: tribalism and greed. The United States has not been so disunited since 1865. The United Kingdom will not remain united for long (nor, possibly, a kingdom). The European Union, after many expansive years of plenty, is now receding and fighting a losing battle against internal enemies of unity. Despite barbarians outside the gates, the fall of any empire always comes from internal pressure within its borders. In Europe these days, that pressure takes the form of nationalist political parties. In Spain, the autonomous region of Catalonia held an illegal referendum on independence on 1 October, 2017. In Italy, the regions of Lombardy and Veneto are holding a legal referendum on autonomy on 22 October, 2017. It seems that the first step to independence is greater autonomy, and that is what Lega Nord, the dominant political party in the north of Italy, has been agitating for ever since it was founded in 1991. Though I am not Italian, I have lived in the Veneto region for over 10 years, and this is where I will now focus. Łiga Veneta (that strange L is supposed to represent elision in the local dialect, though I’ve never heard this elided L at the beginning of a word) is a political party allied with the Lega Nord, both of which ultimately want to secede from the Republic of Italy to form a new nation called Padania. Why would they want to do this? Obviously it’s all about the money. The north of Italy is much wealthier than the south, and supporters of the Lega Nord want to keep all that money for themselves. The central policy platform of the Lega Nord is greater fiscal autonomy and eventual secession. It is a populist right-wing party, strongly opposed to immigration and the EU, allied with like-minded parties in other countries such as the French FN and the Dutch PVV. Just as with these other parties, the Lega Nord are not as popular as they like to appear, and they have never been able to translate their separatist sound and fury into electoral success. In the 2013 federal elections, they took about 4% of the national popular vote. In the 2014 European Parliament elections, they took about 6%. Even in their regional strongholds of Lombardy and Veneto, they only took 12% and 10% respectively. They have had a bit more success in the regional elections, winning the governorship for both regions, including a record-high 40% in Veneto in 2015. Despite this, the Lega Nord has never won a majority of votes even in its own territory. Part of that is due to the fractious nature of Italian politics and the huge number of political parties appearing on the ballot (I counted over 100 different party “lists” at one point). Maybe a larger part of it is that northern secession is just not as popular as the Lega Nord wants it to be. Sign advertising the referendum next to my town’s elementary school. It shows the Italian flag torn in half with the intact Venetian flag flying away, an illegal image according to Italian law. I am writing this one week before the referendum on autonomy, so the results are still in doubt. It seems very probable that the “Yes” vote will win in a landslide, though I’m less sure if there will be a quorum. This is not an election between many different political parties and platforms, but merely a single-issue emotional appeal to the citizens of Lombardy and Veneto to “take control of their history and their future”. A few days ago, I noticed an elderly Italian man stuffing papers in my mailbox, going from house to house on foot doing the same throughout my small town. I thought it was probably a fundraiser for a church event or advertising for the town’s upcoming chestnut festival. Almost everyday mailboxes are stuffed with brochures for supermarkets or other local businesses, but 100% of the time these are distributed by African or Asian immigrants (who probably do this work 12 hours a day for a pittance, all so that those reams of wasted paper can go straight to the bin), not by retirees. When I opened the box, I found a well-made, colorful, 25-page pamphlet supporting the “Yes” vote, full of statistics and other propaganda. 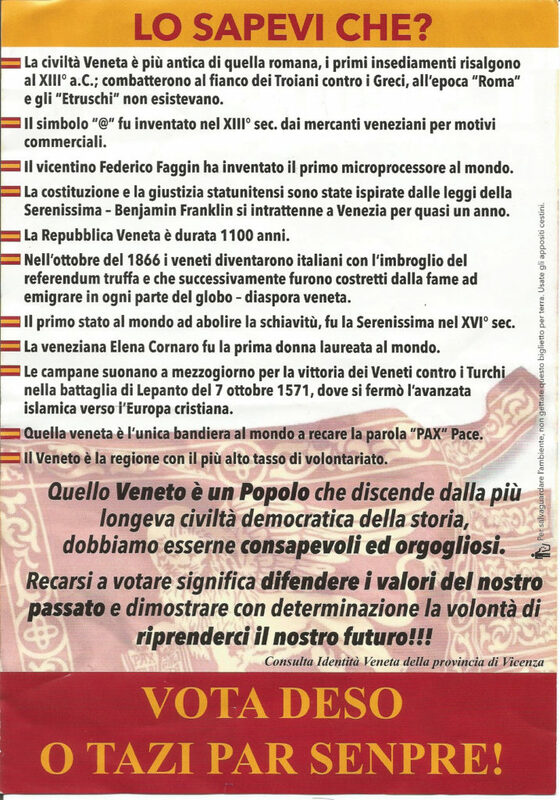 The pamphlet enjoins “The Venetian People” to “rewrite its history” and finishes with the slogan, in Venetian dialect, “Vote Now, or Shut Up Forever.” Catchy. I’m doubtful that the individual tax burden will relent if Veneto becomes autonomous. In fact, the whole referendum seems like a victory for propaganda rather than actual change to the status quo. Unlike the illegal Catalonia independence vote, the Lombardy and Veneto referendum for autonomy is based around a weakly worded question, and even the results would have to be voted on for approval by the full Italian Parliament afterwards. The question appearing on the ballot is: “Do you want the Veneto Region to be given other particular forms and conditions of Autonomy?” Not very specific, to say the least. Yes, that was fun to deconstruct, but propaganda and manipulative emotional appeal for political gain is something that I am always happy to fight against (even if I will probably always be on the losing side). The rest of the pamphlet is a series of tables and cherry-picked statistics basically stating the same thing over and over: that Veneto contributes more money to the federal government than it receives in public services. What a terrible tragedy! A relatively rich region subsidizes other poorer regions in a modern nation-state. It would appear that there is no poverty whatsoever in Veneto, and all its problems comes from the federal government (or immigrants!). This is a widespread opinion among well-off citizens in every developed country; it is the mentality of self-interest over altruism; tribalism over human solidarity. The last part of the pamphlet takes much time and care to compare Veneto with the Autonomous Province of Bolzano, also known as Alto-Adige or Südtirol, the German-speaking, formerly Austrian region ceded to Italy after World War One. One table shows how Alto-Adige keeps 50% of tax revenue for local administration while Veneto keeps only 24%. One point of emphasis is also that education is completely managed locally in Alto-Adige while in Veneto the federal government manages 70% of the budget. There is no reason given for why this is good for Alto-Adige or bad for Veneto. One obvious point is that Alto-Adige is 100% German-speaking and has always been awarded special autonomous status because of its history and culture (along with four other Italian regions with similar situations: Sicily, Sardinia, Fruili-Venezia Guilia, and Val d’Aosta). I have spent a lot of time in schools across Veneto and I can tell you that a huge number of teachers come from the south of Italy (Veneto has a relatively low educational level and the Southern regions are relatively high, probably because there is no work in the South so more people attend university and get advanced degrees). Many residents of Veneto in general also have roots in other parts of Italy or other countries, especially Romania, Morocco, Moldova, and Albania, since there is more work to be found in here. 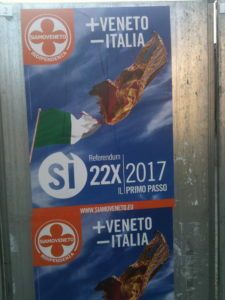 One of the main platforms of the Lega Nord and Łiga Veneta is xenophobic anti-immigration, but given the history of Italian emigration (including huge numbers of Venetians, who mostly fled to Brazil, Argentina, and Australia) it seems myopic and hypocritical to use immigration as a rallying cry. There are plenty of racists in Italy, just like every other country in the world, and the presence of more dark-skinned people on their streets and in their schools and companies has scared the natives. This is unfortunately a universal trait in humans that can only be expunged with education, travel, empathy, and an open mind, many of which are sorely lacking in Italy, Europe, America, and the World. My main question regarding autonomy, secession, and independence is this: why is a smaller political unit necessarily better than a larger one? It seems like flawed logic to me that any given region with mostly arbitrary borders would automatically and by definition be better at governance than a nation-state with mostly arbitrary borders. Why not autonomy or independence for every province, every city, town, village, and house? On the other hand, why isn’t every world region divided into European Union-like entities that together would make up a single world government? The contigencies and accidents of history have determined our present political circumstances. If Princip’s pistol had misfired, if Marshal Ney had taken Quatre Bras earlier, if Ali Pasha hadn’t missed his coffee before Lepanto, if Hektor hadn’t killed Patroklos outside the gates of Troy, history might have turned out differently and there might have been no Veneto, no Italy, and no EU. The point is that history and culture are not the same thing as governance. Appealing to history and culture in the name of more fiscal autonomy is incoherent. I see no evidence that an autonomous or independent Veneto government would be any more efficient or less corrupt than the obviously inefficient and corrupt Italian government. On the other hand, I need only to mention Veneto President Luca Zaia’s project of a new highway called the Superstrada Pedemontana Veneta to make the opposite argument. 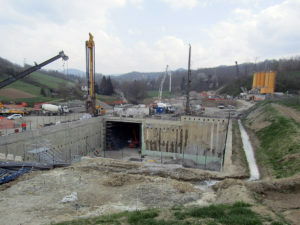 It is an unnecessary highway, that no one asked for, being built across the previously beautiful foothills south of Monte Grappa and the Asiago plateau. It has created a hellscape of endless trucks, dust, and cement where once all you could see were cherry orchards and castles. It is so enormously behind schedule and over budget that it may never be completed. If so, it will be financed by increased taxes on local residents, followed by the additional slap in the face of making it a toll road for the same residents. A recent collapsed tunnel under the hills near my town is the latest construction setback for this environmental and economic disaster. 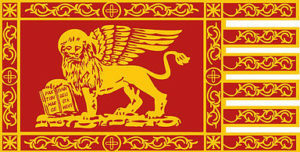 This, along with policies favorable to corrupt, Mafia-driven cementification, enormous banking scandals involving the Popular Bank of Vicenza and Veneto Bank, and the super expensive and useless MOSE flood prevention project surrounding Venice, proves that regional government is no more efficient, capable, or trustworthy than federal government. Absent oppression or persecution, I see no justification for nationalistic separatist movements. That is why the propagandists of these campaigns, including the Brexiteers, rely on disinformation as well as natural human greed and tribalistic tendencies. There is a difference between Kurdish or South Sudanese independence, and that of Catalonia, Scotland, Lombardy, or Veneto. There is nothing wrong with being a proud patriot or even being appreciative of one’s history and culture; there is something wrong with being a nationalist who bends and misuses that history to suit exclusivistic political aims. The best thing to do is to help one’s country and everyone in it to succeed, rather than retreating into a fantasy world of mythical history and no taxes. What’s needed in Italy, Europe, and the whole world is not more division and greed, but more openness, activism, and human solidarity.